Schematic of photosynthesis in plants. The carbohydrates produced are stored in or used by the plant. 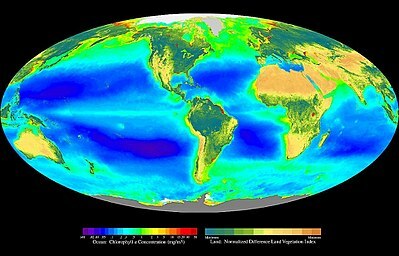 Composite image showing the global distribution of photosynthesis, including both oceanic phytoplankton and terrestrial vegetation. Dark red and blue-green indicate regions of high photosynthetic activity in the ocean and on land, respectively. Photosynthesis is a process used by plants and other organisms to convert light energy into chemical energy that can later be released to fuel the organisms' activities. This chemical energy is stored in carbohydrate molecules, such as sugars, which are synthesized from carbon dioxide and water – hence the name photosynthesis, from the Greek φῶς, phōs, "light", and σύνθεσις, synthesis, "putting together". In most cases, oxygen is also released as a waste product. Most plants, most algae, and cyanobacteria perform photosynthesis; such organisms are called photoautotrophs. Photosynthesis is largely responsible for producing and maintaining the oxygen content of the Earth's atmosphere, and supplies all of the organic compounds and most of the energy necessary for life on Earth. Although photosynthesis is performed differently by different species, the process always begins when energy from light is absorbed by proteins called reaction centres that contain green chlorophyll pigments. In plants, these proteins are held inside organelles called chloroplasts, which are most abundant in leaf cells, while in bacteria they are embedded in the plasma membrane. In these light-dependent reactions, some energy is used to strip electrons from suitable substances, such as water, producing oxygen gas. The hydrogen freed by the splitting of water is used in the creation of two further compounds that serve as short-term stores of energy, enabling its transfer to drive other reactions: these compounds are reduced nicotinamide adenine dinucleotide phosphate (NADPH) and adenosine triphosphate (ATP), the "energy currency" of cells. In plants, algae and cyanobacteria, long-term energy storage in the form of sugars is produced by a subsequent sequence of light-independent reactions called the Calvin cycle; some bacteria use different mechanisms, such as the reverse Krebs cycle, to achieve the same end. In the Calvin cycle, atmospheric carbon dioxide is incorporated into already existing organic carbon compounds, such as ribulose bisphosphate (RuBP). Using the ATP and NADPH produced by the light-dependent reactions, the resulting compounds are then reduced and removed to form further carbohydrates, such as glucose. The first photosynthetic organisms probably evolved early in the evolutionary history of life and most likely used reducing agents such as hydrogen or hydrogen sulfide, rather than water, as sources of electrons. Cyanobacteria appeared later; the excess oxygen they produced contributed directly to the oxygenation of the Earth, which rendered the evolution of complex life possible. Today, the average rate of energy capture by photosynthesis globally is approximately 130 terawatts, which is about eight times the current power consumption of human civilization. Photosynthetic organisms also convert around 100–115 billion tonnes (91-104 petagrams) of carbon into biomass per year. Photosynthetic organisms are photoautotrophs, which means that they are able to synthesize food directly from carbon dioxide and water using energy from light. However, not all organisms use carbon dioxide as a source of carbon atoms to carry out photosynthesis; photoheterotrophs use organic compounds, rather than carbon dioxide, as a source of carbon. In plants, algae, and cyanobacteria, photosynthesis releases oxygen. This is called oxygenic photosynthesis and is by far the most common type of photosynthesis used by living organisms. Although there are some differences between oxygenic photosynthesis in plants, algae, and cyanobacteria, the overall process is quite similar in these organisms. There are also many varieties of anoxygenic photosynthesis, used mostly by certain types of bacteria, which consume carbon dioxide but do not release oxygen. Carbon dioxide is converted into sugars in a process called carbon fixation; photosynthesis captures energy from sunlight to convert carbon dioxide into carbohydrate. Carbon fixation is an endothermic redox reaction. In general outline, photosynthesis is the opposite of cellular respiration: while photosynthesis is a process of reduction of carbon dioxide to carbohydrate, cellular respiration is the oxidation of carbohydrate or other nutrients to carbon dioxide. Nutrients used in cellular respiration include carbohydrates, amino acids and fatty acids. These nutrients are oxidized to produce carbon dioxide and water, and to release chemical energy to drive the organism's metabolism. Photosynthesis and cellular respiration are distinct processes, as they take place through different sequences of chemical reactions and in different cellular compartments. Most organisms that utilize oxygenic photosynthesis use visible light for the light-dependent reactions, although at least three use shortwave infrared or, more specifically, far-red radiation. Some organisms employ even more radical variants of photosynthesis. Some archaea use a simpler method that employs a pigment similar to those used for vision in animals. The bacteriorhodopsin changes its configuration in response to sunlight, acting as a proton pump. This produces a proton gradient more directly, which is then converted to chemical energy. The process does not involve carbon dioxide fixation and does not release oxygen, and seems to have evolved separately from the more common types of photosynthesis. In photosynthetic bacteria, the proteins that gather light for photosynthesis are embedded in cell membranes. In its simplest form, this involves the membrane surrounding the cell itself. However, the membrane may be tightly folded into cylindrical sheets called thylakoids, or bunched up into round vesicles called intracytoplasmic membranes. These structures can fill most of the interior of a cell, giving the membrane a very large surface area and therefore increasing the amount of light that the bacteria can absorb. In plants and algae, photosynthesis takes place in organelles called chloroplasts. A typical plant cell contains about 10 to 100 chloroplasts. The chloroplast is enclosed by a membrane. This membrane is composed of a phospholipid inner membrane, a phospholipid outer membrane, and an intermembrane space. Enclosed by the membrane is an aqueous fluid called the stroma. Embedded within the stroma are stacks of thylakoids (grana), which are the site of photosynthesis. The thylakoids appear as flattened disks. The thylakoid itself is enclosed by the thylakoid membrane, and within the enclosed volume is a lumen or thylakoid space. Embedded in the thylakoid membrane are integral and peripheral membrane protein complexes of the photosynthetic system. Plants absorb light primarily using the pigment chlorophyll. The green part of the light spectrum is not absorbed but is reflected which is the reason that most plants have a green color. Besides chlorophyll, plants also use pigments such as carotenes and xanthophylls. Algae also use chlorophyll, but various other pigments are present, such as phycocyanin, carotenes, and xanthophylls in green algae, phycoerythrin in red algae (rhodophytes) and fucoxanthin in brown algae and diatoms resulting in a wide variety of colors. These pigments are embedded in plants and algae in complexes called antenna proteins. In such proteins, the pigments are arranged to work together. Such a combination of proteins is also called a light-harvesting complex. Although all cells in the green parts of a plant have chloroplasts, the majority of those are found in specially adapted structures called leaves. Certain species adapted to conditions of strong sunlight and aridity, such as many Euphorbia and cactus species, have their main photosynthetic organs in their stems. The cells in the interior tissues of a leaf, called the mesophyll, can contain between 450,000 and 800,000 chloroplasts for every square millimeter of leaf. The surface of the leaf is coated with a water-resistant waxy cuticle that protects the leaf from excessive evaporation of water and decreases the absorption of ultraviolet or blue light to reduce heating. The transparent epidermis layer allows light to pass through to the palisade mesophyll cells where most of the photosynthesis takes place. In the light-dependent reactions, one molecule of the pigment chlorophyll absorbs one photon and loses one electron. This electron is passed to a modified form of chlorophyll called pheophytin, which passes the electron to a quinone molecule, starting the flow of electrons down an electron transport chain that leads to the ultimate reduction of NADP to NADPH. 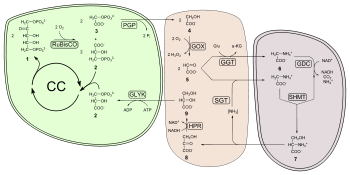 In addition, this creates a proton gradient (energy gradient) across the chloroplast membrane, which is used by ATP synthase in the synthesis of ATP. The chlorophyll molecule ultimately regains the electron it lost when a water molecule is split in a process called photolysis, which releases a dioxygen (O2) molecule as a waste product. Not all wavelengths of light can support photosynthesis. The photosynthetic action spectrum depends on the type of accessory pigments present. For example, in green plants, the action spectrum resembles the absorption spectrum for chlorophylls and carotenoids with absorption peaks in violet-blue and red light. In red algae, the action spectrum is blue-green light, which allows these algae to use the blue end of the spectrum to grow in the deeper waters that filter out the longer wavelengths (red light) used by above ground green plants. The non-absorbed part of the light spectrum is what gives photosynthetic organisms their color (e.g., green plants, red algae, purple bacteria) and is the least effective for photosynthesis in the respective organisms. In plants, light-dependent reactions occur in the thylakoid membranes of the chloroplasts where they drive the synthesis of ATP and NADPH. 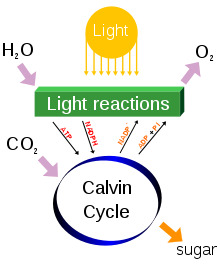 The light-dependent reactions are of two forms: cyclic and non-cyclic. In the non-cyclic reaction, the photons are captured in the light-harvesting antenna complexes of photosystem II by chlorophyll and other accessory pigments (see diagram at right). The absorption of a photon by the antenna complex frees an electron by a process called photoinduced charge separation. The antenna system is at the core of the chlorophyll molecule of the photosystem II reaction center. That freed electron is transferred to the primary electron-acceptor molecule, pheophytin. As the electrons are shuttled through an electron transport chain (the so-called Z-scheme shown in the diagram), it initially functions to generate a chemiosmotic potential by pumping proton cations (H+) across the membrane and into the thylakoid space. An ATP synthase enzyme uses that chemiosmotic potential to make ATP during photophosphorylation, whereas NADPH is a product of the terminal redox reaction in the Z-scheme. The electron enters a chlorophyll molecule in Photosystem I. There it is further excited by the light absorbed by that photosystem. The electron is then passed along a chain of electron acceptors to which it transfers some of its energy. The energy delivered to the electron acceptors is used to move hydrogen ions across the thylakoid membrane into the lumen. The electron is eventually used to reduce the co-enzyme NADP with a H+ to NADPH (which has functions in the light-independent reaction); at that point, the path of that electron ends. The cyclic reaction is similar to that of the non-cyclic, but differs in that it generates only ATP, and no reduced NADP (NADPH) is created. The cyclic reaction takes place only at photosystem I. Once the electron is displaced from the photosystem, the electron is passed down the electron acceptor molecules and returns to photosystem I, from where it was emitted, hence the name cyclic reaction. Linear electron transport through a photosystem will leave the reaction center of that photosystem oxidized. Elevating another electron will first require re-reduction of the reaction center. The excited electrons lost from the reaction center (P700) of photosystem I are replaced by transfer from plastocyanin, whose electrons come from electron transport through photosystem II. Photosystem II, as the first step of the Z-scheme, requires an external source of electrons to reduce its oxidized chlorophyll a reaction center, called P680. The source of electrons for photosynthesis in green plants and cyanobacteria is water. Two water molecules are oxidized by four successive charge-separation reactions by photosystem II to yield a molecule of diatomic oxygen and four hydrogen ions. The electrons yielded are transferred to a redox-active tyrosine residue that then reduces the oxidized P680. This resets the ability of P680 to absorb another photon and release another photo-dissociated electron. The oxidation of water is catalyzed in photosystem II by a redox-active structure that contains four manganese ions and a calcium ion; this oxygen-evolving complex binds two water molecules and contains the four oxidizing equivalents that are used to drive the water-oxidizing reaction (Dolai's S-state diagrams). Photosystem II is the only known biological enzyme that carries out this oxidation of water. 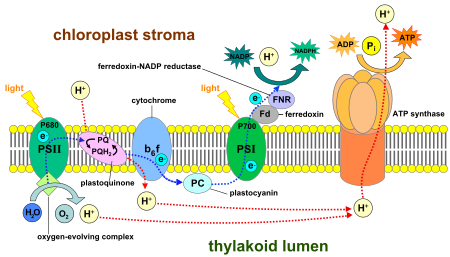 The hydrogen ions are released in the thylakoid lumen andd therefore contribute to the transmembrane chemiosmotic potential that leads to ATP synthesis. Oxygen is a waste product of light-dependent reactions, but the majority of organisms on Earth use oxygen for cellular respiration, including photosynthetic organisms. Carbon fixation produces the intermediate three-carbon sugar product, which is then converted into the final carbohydrate products. The simple carbon sugars produced by photosynthesis are then used in the forming of other organic compounds, such as the building material cellulose, the precursors for lipid and amino acid biosynthesis, or as a fuel in cellular respiration. The latter occurs not only in plants but also in animals when the energy from plants is passed through a food chain. The fixation or reduction of carbon dioxide is a process in which carbon dioxide combines with a five-carbon sugar, ribulose 1,5-bisphosphate, to yield two molecules of a three-carbon compound, glycerate 3-phosphate, also known as 3-phosphoglycerate. Glycerate 3-phosphate, in the presence of ATP and NADPH produced during the light-dependent stages, is reduced to glyceraldehyde 3-phosphate. This product is also referred to as 3-phosphoglyceraldehyde (PGAL) or, more generically, as triose phosphate. Most (5 out of 6 molecules) of the glyceraldehyde 3-phosphate produced is used to regenerate ribulose 1,5-bisphosphate so the process can continue. The triose phosphates not thus "recycled" often condense to form hexose phosphates, which ultimately yield sucrose, starch and cellulose. The sugars produced during carbon metabolism yield carbon skeletons that can be used for other metabolic reactions like the production of amino acids and lipids. 2 concentration in the leaves under these conditions. 2 fixation and, thus, the photosynthetic capacity of the leaf. C4 plants can produce more sugar than C3 plants in conditions of high light and temperature. Many important crop plants are C4 plants, including maize, sorghum, sugarcane, and millet. 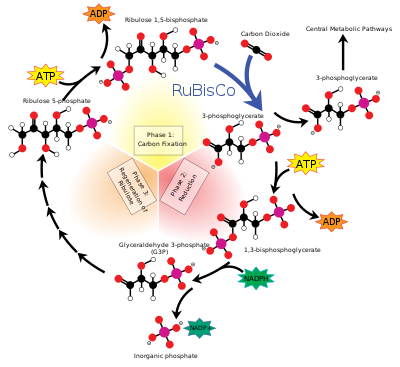 Plants that do not use PEP-carboxylase in carbon fixation are called C3 plants because the primary carboxylation reaction, catalyzed by RuBisCO, produces the three-carbon 3-phosphoglyceric acids directly in the Calvin-Benson cycle. Over 90% of plants use C3 carbon fixation, compared to 3% that use C4 carbon fixation; however, the evolution of C4 in over 60 plant lineages makes it a striking example of convergent evolution. 2 inside the leaves, thus allowing carbon fixation to 3-phosphoglycerate by RuBisCO. Sixteen thousand species of plants use CAM. Plants usually convert light into chemical energy with a photosynthetic efficiency of 3–6%. 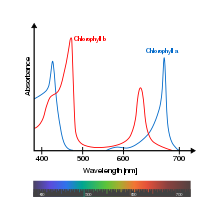 Absorbed light that is unconverted is dissipated primarily as heat, with a small fraction (1–2%) re-emitted as chlorophyll fluorescence at longer (redder) wavelengths. This fact allows measurement of the light reaction of photosynthesis by using chlorophyll fluorometers. Actual plants' photosynthetic efficiency varies with the frequency of the light being converted, light intensity, temperature and proportion of carbon dioxide in the atmosphere, and can vary from 0.1% to 8%. By comparison, solar panels convert light into electric energy at an efficiency of approximately 6–20% for mass-produced panels, and above 40% in laboratory devices. The efficiency of both light and dark reactions can be measured but the relationship between the two can be complex. For example, the ATP and NADPH energy molecules, created by the light reaction, can be used for carbon fixation or for photorespiration in C3 plants. Electrons may also flow to other electron sinks. For this reason, it is not uncommon for authors to differentiate between work done under non-photorespiratory conditions and under photorespiratory conditions. Chlorophyll fluorescence of photosystem II can measure the light reaction, and Infrared gas analyzers can measure the dark reaction. It is also possible to investigate both at the same time using an integrated chlorophyll fluorometer and gas exchange system, or by using two separate systems together. Infrared gas analyzers and some moisture sensors are sensitive enough to measure the photosynthetic assimilation of CO2, and of ΔH2O using reliable methods CO2 is commonly measured in μmols/m2/s−1, parts per million or volume per million and H20 is commonly measured in mmol/m2/s−1 or in mbars. By measuring CO2 assimilation, ΔH2O, leaf temperature, barometric pressure, leaf area, and photosynthetically active radiation or PAR, it becomes possible to estimate, “A” or carbon assimilation, “E” or transpiration, “gs” or stomatal conductance, and Ci or intracellular CO2. However, it is more common to used chlorophyll fluorescence for plant stress measurement, where appropriate, because the most commonly used measuring parameters FV/FM and Y(II) or F/FM’ can be made in a few seconds, allowing the measurement of larger plant populations. Gas exchange systems that offer control of CO2 levels, above and below ambient, allow the common practice of measurement of A/Ci curves, at different CO2 levels, to characterize a plant’s photosynthetic response. Integrated chlorophyll fluorometer – gas exchange systems allow a more precise measure of photosynthetic response and mechanisms. While standard gas exchange photosynthesis systems can measure Ci, or substomatal CO2 levels, the addition of integrated chlorophyll fluorescence measurements allows a more precise measurement of CC to replace Ci. 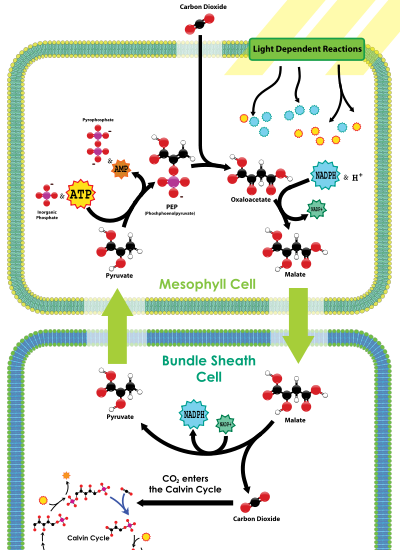 The estimation of CO2 at the site of carboxylation in the chloroplast, or CC, becomes possible with the measurement of mesophyll conductance or gm using an integrated system. Photosynthesis measurement systems are not designed to directly measure the amount of light absorbed by the leaf. But analysis of chlorophyll-fluorescence, P700- and P515-absorbance and gas exchange measurements reveal detailed information about e.g. the photosystems, quantum efficiency and the CO2 assimilation rates. With some instruments even wavelength-dependency of the photosynthetic efficiency can be analyzed. A phenomenon known as quantum walk increases the efficiency of the energy transport of light significantly. In the photosynthetic cell of an algae, bacterium, or plant, there are light-sensitive molecules called chromophores arranged in an antenna-shaped structure named a photocomplex. When a photon is absorbed by a chromophore, it is converted into a quasiparticle referred to as an exciton, which jumps from chromophore to chromophore towards the reaction center of the photocomplex, a collection of molecules that traps its energy in a chemical form that makes it accessible for the cell's metabolism. The exciton's wave properties enable it to cover a wider area and try out several possible paths simultaneously, allowing it to instantaneously "choose" the most efficient route, where it will have the highest probability of arriving at its destination in the minimum possible time. Because that quantum walking takes place at temperatures far higher than quantum phenomena usually occur, it is only possible over very short distances, due to obstacles in the form of destructive interference that come into play. These obstacles cause the particle to lose its wave properties for an instant before it regains them once again after it is freed from its locked position through a classic "hop". The movement of the electron towards the photo center is therefore covered in a series of conventional hops and quantum walks. Early photosynthetic systems, such as those in green and purple sulfur and green and purple nonsulfur bacteria, are thought to have been anoxygenic, and used various other molecules as electron donors rather than water. Green and purple sulfur bacteria are thought to have used hydrogen and sulfur as electron donors. Green nonsulfur bacteria used various amino and other organic acids as an electron donor. Purple nonsulfur bacteria used a variety of nonspecific organic molecules. The use of these molecules is consistent with the geological evidence that Earth's early atmosphere was highly reducing at that time. Fossils of what are thought to be filamentous photosynthetic organisms have been dated at 3.4 billion years old. More recent studies, reported in March 2018, also suggest that photosynthesis may have begun about 3.4 billion years ago. 2) in the photosynthetic reaction center. Several groups of animals have formed symbiotic relationships with photosynthetic algae. These are most common in corals, sponges and sea anemones. It is presumed that this is due to the particularly simple body plans and large surface areas of these animals compared to their volumes. In addition, a few marine mollusks Elysia viridis and Elysia chlorotica also maintain a symbiotic relationship with chloroplasts they capture from the algae in their diet and then store in their bodies (see Kleptoplasty). This allows the mollusks to survive solely by photosynthesis for several months at a time. Some of the genes from the plant cell nucleus have even been transferred to the slugs, so that the chloroplasts can be supplied with proteins that they need to survive. An even closer form of symbiosis may explain the origin of chloroplasts. Chloroplasts have many similarities with photosynthetic bacteria, including a circular chromosome, prokaryotic-type ribosome, and similar proteins in the photosynthetic reaction center. The endosymbiotic theory suggests that photosynthetic bacteria were acquired (by endocytosis) by early eukaryotic cells to form the first plant cells. Therefore, chloroplasts may be photosynthetic bacteria that adapted to life inside plant cells. Like mitochondria, chloroplasts possess their own DNA, separate from the nuclear DNA of their plant host cells and the genes in this chloroplast DNA resemble those found in cyanobacteria. DNA in chloroplasts codes for redox proteins such as those found in the photosynthetic reaction centers. The CoRR Hypothesis proposes that this Co-location of genes with their gene products is required for Redox Regulation of gene expression, and accounts for the persistence of DNA in bioenergetic organelles. The biochemical capacity to use water as the source for electrons in photosynthesis evolved once, in a common ancestor of extant cyanobacteria (formerly called blue-green algae). The geological record indicates that this transforming event took place early in Earth's history, at least 2450–2320 million years ago (Ma), and, it is speculated, much earlier. Because the Earth's atmosphere contained almost no oxygen during the estimated development of photosynthesis, it is believed that the first photosynthetic cyanobacteria did not generate oxygen. Available evidence from geobiological studies of Archean (>2500 Ma) sedimentary rocks indicates that life existed 3500 Ma, but the question of when oxygenic photosynthesis evolved is still unanswered. A clear paleontological window on cyanobacterial evolution opened about 2000 Ma, revealing an already-diverse biota of Cyanobacteria. Cyanobacteria remained the principal primary producers of oxygen throughout the Proterozoic Eon (2500–543 Ma), in part because the redox structure of the oceans favored photoautotrophs capable of nitrogen fixation. Green algae joined blue-green algae as the major primary producers of oxygen on continental shelves near the end of the Proterozoic, but it was only with the Mesozoic (251–66 Ma) radiations of dinoflagellates, coccolithophorids, and diatoms did the primary production of oxygen in marine shelf waters take modern form. Cyanobacteria remain critical to marine ecosystems as primary producers of oxygen in oceanic gyres, as agents of biological nitrogen fixation, and, in modified form, as the plastids of marine algae. Jan van Helmont began the research of the process in the mid-17th century when he carefully measured the mass of the soil used by a plant and the mass of the plant as it grew. After noticing that the soil mass changed very little, he hypothesized that the mass of the growing plant must come from the water, the only substance he added to the potted plant. His hypothesis was partially accurate – much of the gained mass also comes from carbon dioxide as well as water. However, this was a signaling point to the idea that the bulk of a plant's biomass comes from the inputs of photosynthesis, not the soil itself. Joseph Priestley, a chemist and minister, discovered that, when he isolated a volume of air under an inverted jar, and burned a candle in it (which gave off CO2), the candle would burn out very quickly, much before it ran out of wax. He further discovered that a mouse could similarly "injure" air. He then showed that the air that had been "injured" by the candle and the mouse could be restored by a plant. In 1778, Jan Ingenhousz, repeated Priestley's experiments. He discovered that it was the influence of sunlight on the plant that could cause it to revive a mouse in a matter of hours. Cornelis Van Niel made key discoveries explaining the chemistry of photosynthesis. By studying purple sulfur bacteria and green bacteria he was the first to demonstrate that photosynthesis is a light-dependent redox reaction, in which hydrogen reduces (donates its – electron to) carbon dioxide. Robert Emerson discovered two light reactions by testing plant productivity using different wavelengths of light. With the red alone, the light reactions were suppressed. When blue and red were combined, the output was much more substantial. Thus, there were two photosystems, one absorbing up to 600 nm wavelengths, the other up to 700 nm. The former is known as PSII, the latter is PSI. PSI contains only chlorophyll "a", PSII contains primarily chlorophyll "a" with most of the available chlorophyll "b", among other pigment. These include phycobilins, which are the red and blue pigments of red and blue algae respectively, and fucoxanthol for brown algae and diatoms. The process is most productive when the absorption of quanta are equal in both the PSII and PSI, assuring that input energy from the antenna complex is divided between the PSI and PSII system, which in turn powers the photochemistry. Melvin Calvin works in his photosynthesis laboratory. 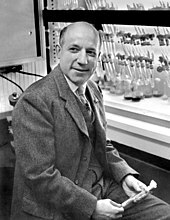 In 1950, first experimental evidence for the existence of photophosphorylation in vivo was presented by Otto Kandler using intact Chlorella cells and interpreting his findings as light-dependent ATP formation. In 1954, Daniel I. Arnon et al. discovered photophosphorylation in vitro in isolated chloroplasts with the help of P32. In 1893, Charles Reid Barnes proposed two terms, photosyntax and photosynthesis, for the biological process of synthesis of complex carbon compounds out of carbonic acid, in the presence of chlorophyll, under the influence of light. Over time, the term photosynthesis came into common usage as the term of choice. Later discovery of anoxygenic photosynthetic bacteria and photophosphorylation necessitated redefinition of the term. After WWII at late 1940 at the University of California, Berkeley, the details of photosynthetic carbon metabolism were sorted out by the chemists Melvin Calvin, Andrew Benson, James Bassham and a score of students and researchers utilizing the carbon-14 isotope and paper chromatography techniques. The pathway of CO2 fixation by the algae Chlorella in a fraction of a second in light resulted in a 3 carbon molecule called phosphoglyceric acid (PGA). For that original and ground-breaking work, a Nobel Prize in Chemistry was awarded to Melvin Calvin in 1961. In parallel, plant physiologists studied leaf gas exchanges using the new method of infrared gas analysis and a leaf chamber where the net photosynthetic rates ranged from 10 to 13 μmol CO2·m-2·s-1, with the conclusion that all terrestrial plants having the same photosynthetic capacities that were light saturated at less than 50% of sunlight. Later in 1958-1963 at Cornell University, field grown maize was reported to have much greater leaf photosynthetic rates of 40 μmol CO2·m-2·s-1 and was not saturated at near full sunlight. This higher rate in maize was almost double those observed in other species such as wheat and soybean, indicating that large differences in photosynthesis exist among higher plants. At the University of Arizona, detailed gas exchange research on more than 15 species of monocot and dicot uncovered for the first time that differences in leaf anatomy are crucial factors in differentiating photosynthetic capacities among species. In tropical grasses, including maize, sorghum, sugarcane, Bermuda grass and in the dicot amaranthus, leaf photosynthetic rates were around 38−40 μmol CO2·m-2·s-1, and the leaves have two types of green cells, i. e. outer layer of mesophyll cells surrounding a tightly packed cholorophyllous vascular bundle sheath cells. This type of anatomy was termed Kranz anatomy in the 19th century by the botanist Gottlieb Haberlandt while studying leaf anatomy of sugarcane. Plant species with the greatest photosynthetic rates and Kranz anatomy showed no apparent photorespiration, very low CO2 compensation point, high optimum temperature, high stomatal resistances and lower mesophyll resistances for gas diffusion and rates never saturated at full sun light. The research at Arizona was designated Citation Classic by the ISI 1986. These species was later termed C4 plants as the first stable compound of CO2 fixation in light has 4 carbon as malate and aspartate. Other species that lack Kranz anatomy were termed C3 type such as cotton and sunflower, as the first stable carbon compound is the 3-carbon PGA acid. At 1000 ppm CO2 in measuring air, both the C3 and C4 plants had similar leaf photosynthetic rates around 60 μmol CO2·m-2·s-1 indicating the suppression of photorespiration in C3 plants. Total photosynthesis is limited by a range of environmental factors. These include the amount of light available, the amount of leaf area a plant has to capture light (shading by other plants is a major limitation of photosynthesis), rate at which carbon dioxide can be supplied to the chloroplasts to support photosynthesis, the availability of water, and the availability of suitable temperatures for carrying out photosynthesis. Absorbance spectra of free chlorophyll a (blue) and b (red) in a solvent. The action spectra of chlorophyll molecules are slightly modified in vivo depending on specific pigment-protein interactions. The process of photosynthesis provides the main input of free energy into the biosphere, and is one of four main ways in which radiation is important for plant life. The radiation climate within plant communities is extremely variable, with both time and space. In the early 20th century, Frederick Blackman and Gabrielle Matthaei investigated the effects of light intensity (irradiance) and temperature on the rate of carbon assimilation. At constant temperature, the rate of carbon assimilation varies with irradiance, increasing as the irradiance increases, but reaching a plateau at higher irradiance. At low irradiance, increasing the temperature has little influence on the rate of carbon assimilation. At constant high irradiance, the rate of carbon assimilation increases as the temperature is increased. ^ "photosynthesis". Online Etymology Dictionary. ^ a b Bryant DA, Frigaard NU (Nov 2006). "Prokaryotic photosynthesis and phototrophy illuminated". Trends in Microbiology. 14 (11): 488–496. doi:10.1016/j.tim.2006.09.001. PMID 16997562. ^ Reece J, Urry L, Cain M, Wasserman S, Minorsky P, Jackson R (2011). Biology (International ed.). Upper Saddle River, NJ: Pearson Education. pp. 235, 244. ISBN 978-0-321-73975-9. This initial incorporation of carbon into organic compounds is known as carbon fixation. ^ Olson JM (May 2006). "Photosynthesis in the Archean era". Photosynthesis Research. 88 (2): 109–117. doi:10.1007/s11120-006-9040-5. PMID 16453059. ^ Buick R (Aug 2008). "When did oxygenic photosynthesis evolve?". Philosophical Transactions of the Royal Society of London, Series B. 363 (1504): 2731–2743. doi:10.1098/rstb.2008.0041. PMC 2606769. PMID 18468984. ^ Nealson KH, Conrad PG (Dec 1999). "Life: past, present and future". Philosophical Transactions of the Royal Society of London, Series B. 354 (1392): 1923–1939. doi:10.1098/rstb.1999.0532. PMC 1692713. PMID 10670014. ^ Whitmarsh J, Govindjee (1999). "The photosynthetic process". In Singhal GS, Renger G, Sopory SK, Irrgang KD, Govindjee (eds.). Concepts in photobiology: photosynthesis and photomorphogenesis. Boston: Kluwer Academic Publishers. pp. 11–51. ISBN 978-0-7923-5519-9. 7017100000000000000♠100×1015 grams of carbon/year fixed by photosynthetic organisms, which is equivalent to 7014126752351256115♠4×1018 kJ/yr = 7014126752351256115♠4×1021 J/yr of free energy stored as reduced carbon. ^ Steger U, Achterberg W, Blok K, Bode H, Frenz W, Gather C, Hanekamp G, Imboden D, Jahnke M, Kost M, Kurz R, Nutzinger HG, Ziesemer T (2005). Sustainable development and innovation in the energy sector. Berlin: Springer. p. 32. ISBN 978-3-540-23103-5. The average global rate of photosynthesis is 130 TW. ^ "World Consumption of Primary Energy by Energy Type and Selected Country Groups, 1980–2004". Energy Information Administration. July 31, 2006. Archived from the original (XLS) on November 9, 2006. Retrieved 2007-01-20. ^ Field CB, Behrenfeld MJ, Randerson JT, Falkowski P (Jul 1998). "Primary production of the biosphere: integrating terrestrial and oceanic components". Science. 281 (5374): 237–240. Bibcode:1998Sci...281..237F. doi:10.1126/science.281.5374.237. PMID 9657713. ^ a b c "Photosynthesis". McGraw-Hill Encyclopedia of Science & Technology. 13. New York: McGraw-Hill. 2007. ISBN 978-0-07-144143-8. ^ Whitmarsh J, Govindjee (1999). [hhttps://books.google.com/books?id=dqSuoOtDM1cC&pg=PA13 "Chapter 2: The Basic Photosynthetic Process"]. In Singhal GS, Renger G, Sopory SK, Irrgang KD, Govindjee (eds.). Concepts in Photobiology: Photosynthesis and Photomorphogenesis. Boston: Kluwer Academic Publishers. p. 13. ISBN 978-0-7923-5519-9. ^ Kulp TR, Hoeft SE, Asao M, Madigan MT, Hollibaugh JT, Fisher JC, Stolz JF, Culbertson CW, Miller LG, Oremland RS (Aug 2008). "Arsenic(III) fuels anoxygenic photosynthesis in hot spring biofilms from Mono Lake, California". Science. 321 (5891): 967–970. Bibcode:2008Sci...321..967K. doi:10.1126/science.1160799. PMID 18703741. ^ "Scientists discover unique microbe in California's largest lake". Retrieved 2009-07-20. ^ Oakley, Todd (19 December 2008). "Evolutionary Novelties: Opsins: An amazing evolutionary convergence". ^ Tavano CL, Donohue TJ (Dec 2006). "Development of the bacterial photosynthetic apparatus". Current Opinion in Microbiology. 9 (6): 625–631. doi:10.1016/j.mib.2006.10.005. PMC 2765710. PMID 17055774. ^ a b Mullineaux CW (1999). "The thylakoid membranes of cyanobacteria: structure, dynamics and function". Australian Journal of Plant Physiology. 26 (7): 671–677. doi:10.1071/PP99027. ^ Sener MK, Olsen JD, Hunter CN, Schulten K (Oct 2007). "Atomic-level structural and functional model of a bacterial photosynthetic membrane vesicle". Proceedings of the National Academy of Sciences of the United States of America. 104 (40): 15723–15728. Bibcode:2007PNAS..10415723S. doi:10.1073/pnas.0706861104. PMC 2000399. PMID 17895378. ^ Campbell NA, Williamson B, Heyden RJ (2006). Biology Exploring Life. Upper Saddle River, NJ: Prentice Hall. ISBN 978-0-13-250882-7. ^ Ziehe, D; Dünschede, B; Schünemann, D (Dec 2018). "Molecular mechanism of SRP-dependent light-harvesting protein transport to the thylakoid membrane in plants". Photosynthesis Research. 138 (3): 303–313. doi:10.1007/s11120-018-0544-6. PMC 6244792. PMID 29956039. ^ a b Raven PH, Evert RF, Eichhorn SE (2005). Biology of Plants (7th ed.). New York: W. H. Freeman and Company. pp. 124–127. ISBN 978-0-7167-1007-3. ^ Dolai U (2017). "Chemical Scheme of Water-Splitting Process during Photosynthesis by the Way of Experimental Analysis". IOSR Journal of Pharmacy and Biological Sciences. 12 (6): 65–67. doi:10.9790/3008-1206026567 (inactive 2019-02-17). ^ "Yachandra Group Home page". ^ Pushkar Y, Yano J, Sauer K, Boussac A, Yachandra VK (Feb 2008). "Structural changes in the Mn4Ca cluster and the mechanism of photosynthetic water splitting". Proceedings of the National Academy of Sciences of the United States of America. 105 (6): 1879–1884. Bibcode:2008PNAS..105.1879P. doi:10.1073/pnas.0707092105. PMC 2542863. PMID 18250316. ^ a b Williams BP, Johnston IG, Covshoff S, Hibberd JM (September 2013). "Phenotypic landscape inference reveals multiple evolutionary paths to C4 photosynthesis". eLife. 2: e00961. doi:10.7554/eLife.00961. PMC 3786385. PMID 24082995. ^ Taiz L, Geiger E (2006). Plant Physiology (4th ed.). Sinauer Associates. ISBN 978-0-87893-856-8. 4 Photosynthesis". C₄ plant biology. Boston: Academic Press. pp. 551–580. ISBN 978-0-12-614440-6. ^ Dodd AN, Borland AM, Haslam RP, Griffiths H, Maxwell K (Apr 2002). "Crassulacean acid metabolism: plastic, fantastic". Journal of Experimental Botany. 53 (369): 569–580. doi:10.1093/jexbot/53.369.569. PMID 11886877. ^ Badger MR, Price GD (Feb 2003). "CO2 concentrating mechanisms in cyanobacteria: molecular components, their diversity and evolution". Journal of Experimental Botany. 54 (383): 609–622. doi:10.1093/jxb/erg076. PMID 12554704. ^ Badger MR, Andrews JT, Whitney SM, Ludwig M, Yellowlees DC, Leggat W, Price GD (1998). "The diversity and coevolution of Rubisco, plastids, pyrenoids, and chloroplast-based CO2-concentrating mechanisms in algae". Canadian Journal of Botany. 76 (6): 1052–1071. doi:10.1139/b98-074. ^ Miyamoto K. "Chapter 1 – Biological energy production". Renewable biological systems for alternative sustainable energy production (FAO Agricultural Services Bulletin – 128). Food and Agriculture Organization of the United Nations. Retrieved 2009-01-04. ^ Maxwell K, Johnson GN (Apr 2000). "Chlorophyll fluorescence--a practical guide". Journal of Experimental Botany. 51 (345): 659–668. doi:10.1093/jexbot/51.345.659. PMID 10938857. ^ Maxwell K, Johnson GN (2000). "Chlorophyll fluorescence – a practical guide". Journal of Experimental Botany. 51 (345): 659–668. doi:10.1093/jxb/51.345.659. ^ Govindjee R. "What is Photosynthesis". Biology at Illinois. ^ a b Rosenqvist E, van Kooten O (2006). "Chapter 2: Chlorophyll Fluorescence: A General Description and Nomenclature". In DeEll JA, Toivonen PM (eds.). Practical Applications of Chlorophyll Fluorescence in Plant Biology. Dordrecht, the Netherlands: Kluwer Academic Publishers. pp. 39–78. ^ Baker NR, Oxborough K (2004). "Chapter 3: Chlorophyll fluorescence as a probe of photosynthetic productivity". In Papaqeorgiou G, Govindjee (eds.). Chlorophylla Fluorescence a Signature of Photosynthesis. Dordrecht, The Netherlands: Springer. pp. 66–79. ^ Flexas J, Escalnona JM, Medrano H (January 1999). "Water stress induces different levels of photosynthesis and electron transport rate regulation in grapevines". Plant, Cell and Environment. 22 (1): 39–48. doi:10.1046/j.1365-3040.1999.00371.x. ^ Fryer MJ, Andrews JR, Oxborough K, Blowers DA, Baker NR (1998). "Relationship between CO2 Assimilation, Photosynthetic Electron Transport, and Active O2 Metabolism in Leaves of Maize in the Field during Periods of Low Temperature". Plant Physiology. 116 (2): 571–580. doi:10.1104/pp.116.2.571. PMC 35114. PMID 9490760. ^ Earl H, Said Ennahli S (2004). "Estimating photosynthetic electron transport via chlorophyll fluorometry without Photosystem II light saturation". Photosynthesis Research. 82 (2): 177–186. doi:10.1007/s11120-004-1454-3. PMID 16151873. ^ Genty B, Briantais J, Baker NR (1989). "MThe relationship between the quantum yield of photosynthetic electron transport and quenching of chlorophyll fluorescence". Biochimica et Biophysica Acta. 990 (1): 87–92. doi:10.1016/s0304-4165(89)80016-9. ^ a b Baker NR (2008). "Chlorophyll Fluorescence: A Probe of Photosynthesis In Vivo". Annu. Rev. Plant Biol. 59: 89–113. doi:10.1146/annurev.arplant.59.032607.092759. PMID 18444897. ^ a b c Bernacchi CJ, Portis AR, Nakano H, von Caemmerer S, Long SP (2002). "Temperature response of mesophyll conductance. Implications for the determination of Rubisco enzyme kinetics and for limitations to photosynthesis in vivo". Plant Physiology. 130 (4): 1992–1998. doi:10.1104/pp.008250. PMC 166710. PMID 12481082. ^ a b c d Ribas-Carbo M, Flexas J, Robinson SA, Tcherkez GG (2010). "In vivo measurement of plant respiration". University of Wollongong Research Online. ^ a b c d Long SP, Bernacchi CJ (2003). "Gas exchange measurements, what can they tell us about the underlying limitations to photosynthesis? Procedures and sources of error". Journal of Experimental Botany. 54 (392): 2393–2401. doi:10.1093/jxb/erg262. PMID 14512377. ^ Bernacchi CJ, Portis A (2002). "R., Nakano H., von Caemmerer S., and Long S.P. (2002) Temperature Response of Mesophyll Conductance. Implications for the Determination of Rubisco Enzyme Kinetics and for Limitations to Photosynthesis in Vivo". Plant Physiology. 130 (4): 1992–1998. doi:10.1104/pp.008250. PMC 166710. PMID 12481082. ^ YIN X, Struik PC (2009). "Theoretical reconsiderations when estimating the mesophyll conductanceto CO2 diffusion in leaves of C3 plants by analysis of combined gas exchange and chlorophyll fluorescence measurements pce_2016 1513..1". Plant, Cell and Environment. 32 (11): 1513–1524 . doi:10.1111/j.1365-3040.2009.02016.x. PMID 19558403. ^ Schreiber U, Klughammer C, Kolbowski J (2012). "Assessment of wavelength-dependent parameters of photosynthetic electron transport with a new type of multi-color PAM chlorophyll fluorometer". Photosynthesis Research. 113 (1–3): 127–144. doi:10.1007/s11120-012-9758-1. PMC 3430841. PMID 22729479. ^ Palmer J (21 June 2013). "Plants 'seen doing quantum physics'". BBC News. ^ Lloyd S (10 March 2014). "Quantum Biology: Better Living Through Quantum Mechanics – The Nature of Reality". Nova: PBS Online, WGBH Boston. ^ Hildner R, Brinks D, Nieder JB, Cogdell RJ, van Hulst NF (Jun 2013). "Quantum coherent energy transfer over varying pathways in single light-harvesting complexes". Science. 340 (6139): 1448–1451. Bibcode:2013Sci...340.1448H. doi:10.1126/science.1235820. PMID 23788794. ^ Gale J (2009). Astrobiology of Earth : The emergence, evolution and future of life on a planet in turmoil. OUP Oxford. pp. 112–113. ISBN 978-0-19-154835-2. ^ Davis K (2 October 2004). "Photosynthesis got a really early start". New Scientist. ^ Hooper R (19 August 2006). "Revealing the dawn of photosynthesis". New Scientist. ^ Caredona, Tanai (6 March 2018). "Early Archean origin of heterodimeric Photosystem I". Elsevier. 4 (3): e00548. doi:10.1016/j.heliyon.2018.e00548. PMC 5857716. PMID 29560463. Retrieved 23 March 2018. ^ Howard, Victoria (7 March 2018). "Photosynthesis Originated A Billion Years Earlier Than We Thought, Study Shows". Astrobiology Magazine. Retrieved 23 March 2018. ^ Venn AA, Loram JE, Douglas AE (2008). "Photosynthetic symbioses in animals". Journal of Experimental Botany. 59 (5): 1069–1080. doi:10.1093/jxb/erm328. PMID 18267943. ^ Rumpho ME, Summer EJ, Manhart JR (May 2000). "Solar-powered sea slugs. Mollusc/algal chloroplast symbiosis". Plant Physiology. 123 (1): 29–38. doi:10.1104/pp.123.1.29. PMC 1539252. PMID 10806222. ^ Muscatine L, Greene RW (1973). Chloroplasts and algae as symbionts in molluscs. International Review of Cytology. 36. pp. 137–169. doi:10.1016/S0074-7696(08)60217-X. ISBN 978-0-12-364336-0. PMID 4587388. ^ Rumpho ME, Worful JM, Lee J, Kannan K, Tyler MS, Bhattacharya D, Moustafa A, Manhart JR (Nov 2008). "Horizontal gene transfer of the algal nuclear gene psbO to the photosynthetic sea slug Elysia chlorotica". Proceedings of the National Academy of Sciences of the United States of America. 105 (46): 17867–17871. Bibcode:2008PNAS..10517867R. doi:10.1073/pnas.0804968105. PMC 2584685. PMID 19004808. ^ Douglas SE (Dec 1998). "Plastid evolution: origins, diversity, trends". Current Opinion in Genetics & Development. 8 (6): 655–661. doi:10.1016/S0959-437X(98)80033-6. PMID 9914199. ^ Reyes-Prieto A, Weber AP, Bhattacharya D (2007). "The origin and establishment of the plastid in algae and plants". Annual Review of Genetics. 41: 147–168. doi:10.1146/annurev.genet.41.110306.130134. PMID 17600460. ^ Raven JA, Allen JF (2003). "Genomics and chloroplast evolution: what did cyanobacteria do for plants?". Genome Biology. 4 (3): 209. doi:10.1186/gb-2003-4-3-209. PMC 153454. PMID 12620099. ^ Allen JF (December 2017). "The CoRR hypothesis for genes in organelles". J. Theor. Biol. 434: 50–57. doi:10.1016/j.jtbi.2017.04.008. PMID 28408315. ^ Tomitani A, Knoll AH, Cavanaugh CM, Ohno T (Apr 2006). "The evolutionary diversification of cyanobacteria: molecular-phylogenetic and paleontological perspectives". Proceedings of the National Academy of Sciences of the United States of America. 103 (14): 5442–5447. Bibcode:2006PNAS..103.5442T. doi:10.1073/pnas.0600999103. PMC 1459374. PMID 16569695. ^ "Cyanobacteria: Fossil Record". Ucmp.berkeley.edu. Retrieved 2010-08-26. ^ Smith A (2010). Plant biology. New York: Garland Science. p. 5. ISBN 978-0-8153-4025-6. ^ Herrero A, Flores E (2008). The Cyanobacteria: Molecular Biology, Genomics and Evolution (1st ed.). Caister Academic Press. ISBN 978-1-904455-15-8. ^ Walker DA (2002). "'And whose bright presence' – an appreciation of Robert Hill and his reaction" (PDF). Photosynthesis Research. 73 (1–3): 51–54. doi:10.1023/A:1020479620680. PMID 16245102. ^ Kandler, Otto (1950). "Über die Beziehungen zwischen Phosphathaushalt und Photosynthese. I. Phosphatspiegelschwankungen bei Chlorella pyrenoidosa als Folge des Licht-Dunkel-Wechsels" [On the relationship between the phosphate metabolism and photosynthesis I. Variations in phosphate levels in Chlorella pyrenoidosa as a consequence of light-dark changes] (PDF). Zeitschrift für Naturforschung. 5b (8): 423–437. doi:10.1515/znb-1950-0806. ^ Arnon, Daniel I.; Allen, M.B. ; Whatley, F.R. (1954). "Photosynthesis by isolated chloroplasts. II. Photophosphorylation, the conversion of light into phosphate bond energy". J Am Chem Soc. 76 (24): 6324–6329. doi:10.1021/ja01653a025. ^ Arnon, Daniel I. (1956). "Phosphorus metabolism and photosynthesis". Review of Plant Physiology. 7: 325–354. doi:10.1146/annurev.pp.07.060156.001545. ^ Gest H (2002). "History of the word photosynthesis and evolution of its definition". Photosynthesis Research. 73 (1–3): 7–10. doi:10.1023/A:1020419417954. PMID 16245098. ^ Calvin M (July 1989). "Forty years of photosynthesis and related activities". Photosynthesis Research. 21 (1): 3–16. doi:10.1007/BF00047170 (inactive 2019-02-17). PMID 24424488. ^ Verduin J (1953). "A table of photosynthesis rates under optimal, near natural conditions". Am. J. Bot. 40 (9): 675–679. doi:10.1002/j.1537-2197.1953.tb06540.x. JSTOR 2439681. ^ Verduin J, Whitwer EE, Cowell BC (1959). "Maximal photosynthetic rates in nature". Science. 130 (3370): 268–269. Bibcode:1959Sci...130..268V. doi:10.1126/science.130.3370.268. PMID 13668557. ^ Hesketh JD, Musgrave R (1962). "Photosynthesis under field conditions. IV. Light studies with individual corn leaves". Crop Sci. 2 (4): 311–315. doi:10.2135/cropsci1962.0011183x000200040011x. ^ Hesketh JD, Moss DN (1963). "Variation in the response of photosynthesis to light". Crop Sci. 3 (2): 107–110. doi:10.2135/cropsci1963.0011183X000300020002x. ^ a b El-Sharkawy, MA, Hesketh JD (1965). "Photosynthesis among species in relation to characteristics of leaf anatomy and CO2 diffusion resistances". Crop Sci. 5 (6): 517–521. doi:10.2135/cropsci1965.0011183x000500060010x. ^ Haberlandt G (1904). Physiologische Pflanzanatomie. Leipzig: Engelmann. ^ El-Sharkawy MA (1965). Factors Limiting Photosynthetic Rates of Different Plant Species (Ph.D. thesis). The University of Arizona, Tucson, USA. ^ Karpilov YS (1960). "The distribution of radioactvity in carbon-14 among the products of photosynthesis in maize". Proc. Kazan Agric. Inst. 14: 15–24. ^ Kortschak HP, Hart CE, Burr GO (1965). "Carbon dioxide fixation in sugarcane leaves". Plant Physiol. 40 (2): 209–213. doi:10.1104/pp.40.2.209. PMC 550268. PMID 16656075. ^ Hatch MD, Slack CR (1966). "Photosynthesis by sugar-cane leaves. A new carboxylation reaction and the pathway of sugar formation". Biochem. J. 101 (1): 103–111. doi:10.1042/bj1010103. PMC 1270070. PMID 5971771. ^ Chapin FS, Matson PA, Mooney HA (2002). Principles of Terrestrial Ecosystem Ecology. New York: Springer. pp. 97–104. ISBN 978-0-387-95443-1. ^ Jones HG (2014). Plants and Microclimate: a Quantitative Approach to Environmental Plant Physiology (Third ed.). Cambridge: Cambridge University Press. ISBN 978-0-521-27959-8. Bidlack JE, Stern KR, Jansky S (2003). Introductory Plant Biology. New York: McGraw-Hill. ISBN 978-0-07-290941-8. Blankenship RE (2014). Molecular Mechanisms of Photosynthesis (2nd ed.). John Wiley & Sons. ISBN 978-1-4051-8975-0. Govindjee, Beatty JT, Gest H, Allen JF (2006). Discoveries in Photosynthesis. Advances in Photosynthesis and Respiration. 20. Berlin: Springer. ISBN 978-1-4020-3323-0. Reece JB, et al. (2013). Campbell Biology. Benjamin Cummings. ISBN 978-0-321-77565-8. Gupta RS, Mukhtar T, Singh B (Jun 1999). "Evolutionary relationships among photosynthetic prokaryotes (Heliobacterium chlorum, Chloroflexus aurantiacus, cyanobacteria, Chlorobium tepidum and proteobacteria): implications regarding the origin of photosynthesis". Molecular Microbiology. 32 (5): 893–906. doi:10.1046/j.1365-2958.1999.01417.x. PMID 10361294. Rutherford AW, Faller P (Jan 2003). "Photosystem II: evolutionary perspectives". Philosophical Transactions of the Royal Society of London. Series B, Biological Sciences. 358 (1429): 245–253. doi:10.1098/rstb.2002.1186. PMC 1693113. PMID 12594932. Marshall J (2011-03-29). 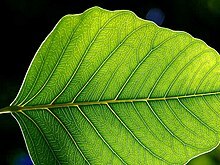 "First practical artificial leaf makes debut". Discovery News. Ehrenberg R (2017-12-15). "The photosynthesis fix". Knowable Magazine.